The success of the modern sales process depends on the efforts of a complete team. No single rep can handle all the activities involved in all the different stages of a sales funnel. And when they try to do so, context-switching can’t be avoided; also it takes in a lot of time and endeavor. This will not only affect the total number of deals being made, but also the skills of the sales rep. Instead of juggling a number of different tasks at a time, if she/he focuses on a single task, they’ll be skilled in it and the quality won’t suffer. You probably have already separated out Marketing, Sales Development Reps, and Account Executives. These three different people work on different stages of the funnel, top, middle and bottom respectively, to work more efficiently by setting right goals, developing processes, measuring success, iterating the processes and improving them to close more deals. Now, this is not it, each task can also be broken into smaller sub-tasks. In this scenario, if you need to focus on one task at a time, and still get everything together in one place, and take it towards the growth of your organization, then you need a properly optimized workflow that is supported with better automation. HubSpot is one of the best sales automation companies and offers a sales team management software, with which you can easily streamline the sales workflows and ensure superior sales tracking and monitoring. Manual research and lookup for the data related to your prospects takes a lot of time. 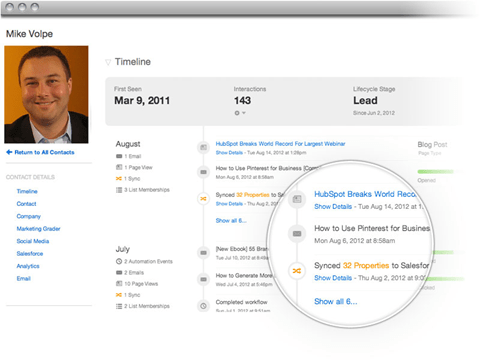 HubSpot helps you find out all the information on companies and the key elements that may shape your decisions quickly. You get notified the instant prospects open an email, click a link, or open an attachment. You also know when a particular person landed on your website and on which page and it is also logged automatically into your system, eliminating the time consumed by manual data entries. This also helps in timely, relevant follow-up with the hottest leads. Personalized emails and other conversations are a must for converting prospects into customers. And that’s where sales reps lose a lot of their time. Besides that, sending out the personalized emails quickly while they’re still of interest to the prospect is also important. HubSpot’s email tool lets you queue up a sequence of personalized follow-up emails and reminders that get delivered automatically at the right time. As a smart manager, by now, you must be aware that using just the behavioral pattern while scoring leads is not enough. Along with that, you need to draw more data programmatically regarding each new prospect as they come in, finding out what characteristics all your customers share, etc. And that’s where a sales automation tool comes in to help you. You can also automate time-consuming tasks like lead rotation, task creation, and more. While Hubspot Sales Pro has a Starter package for $50 (it has a Free trial version as well), Hubspot CRM is completely free forever! Hubspot’s all-in-one sales software is the best sales automation tool that helps you to tie it all up together in a single tool! It helps you close more leads fast and efficiently, lets you track deals that you won or lost or those in progress, and see which reps are your best performers and what made them the best performers. TL;DR: The more you ask your sales reps to do, the less they’ll actually be able to do. Give each member of your team a definite goal, set a sales workflow that removes multitasking, only then you can see sales productivity skyrocket along with your revenue. And you can do all of this with the help of a right sales automation tool! Need assistance with the setup of your sales workflow? Connect with the Sales Experts at Prodigitas that are also certified by HubSpot. Prodigitas equips small and mid-size B2B marketers and business leaders with world-class & enterprise-grade marketing and sales automation technology, strategy and services to generate demand, and manage growth.